In Thackeray’s Haunts and Homes, Eyre Crowe recalled that William Makepeace Thackeray had gone to Ireland in 1842. 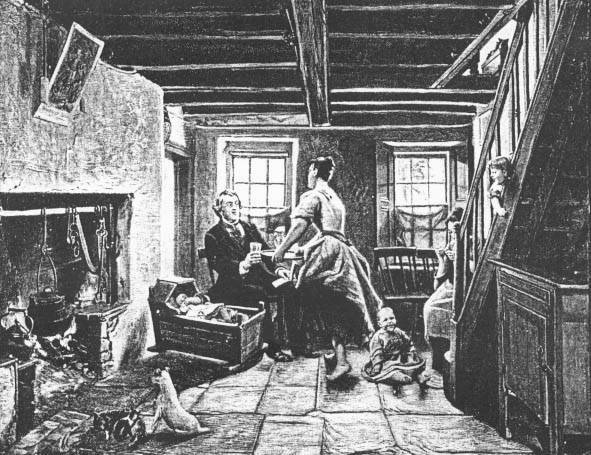 Crowe himself visited Ireland some years later and searched out the house immortalised by Thackeray in his Irish Sketch Book. ‘Here is the cheery interior, with the simmering pot of murphies and the indwellers, as the wonderful verses described – drawn by him who pens these lines, who must record his delight at the discovery of this country tap-room quite unchanged’ (Thackeray’s Haunts and Homes, p. 38). [Comparing George A. Storey and Eyre Crowe:] Although they both deal in humerous and pathetic genre, these painters work in moods and methods, to say nothing of their respective manners, which are very distinctly defined, the one [Storey] inclining to follow De Hoogue, the other to Hogarth – painters who are less far apart than might be supposed. Mr. Storey’s sense of grace and his affection for light, shade and tone save him from the worst faults of Mr. Crowe, who is, however, a sterling humourist of the more masculine strain, and the nearest of the moderns to Hogarth … Mr. Crowe’s ‘Nelson at Portsmouth’ [correctly, ‘Nelson leaving England for the last time’ (1888)] showed that he has not always a keen sense of the ridiculous, yet his ‘Brothers of the Brush’  and ‘Dr Johnson in Fleet Street’ [unidentified; possibly ‘A Scene at the Mitre’ (1857)] are happy specimens of humour … Mr. Crowe’s single contribution, Peg of Limavaddy (802), owes its subject to the narrative of Thackeray’s visit to Limavaddy, that lively Irish town, whose comely ‘Peg’, the buxom maid of the inn, he immortalised. Mr. Crowe went to Limavaddy, and, discovering the inn where the author of ‘Vanity Fair’ put up, painted the room where the satirist caught sight of his heroine, its walls formerly whitewashed, its oaken tables, its rude settles, rough staircase, and windows screened in green. We have them here to the life, warm in lighting, well drawn, and solidly, if rather heavily painted, and, altogether, good and sound in art. Thackeray, an excellent likeness, if not looking rather too old for the event in question, sits at the table, to which the strapping handmaiden approaches with the beer he has asked for. Both the figures are capitally designed and painted, that of the damsel being robust, lithe despite her stays and too abundent skirts, and, in its way, graceful as well as animated – above all, simple and true to nature. The other figures in the room are good. Mr. Eyre Crowe, profiting by his friendship with the late W.M. Thackeray, introduces an excellent portrait of that writer into his picture of ‘Peg of Limavaddy’ (802), who played a subordinate part in Thackeray’s Irish journey.